CEEQUAL Exceptional Achievement Awards recognise projects that demonstrate pinnacle best-practice performance in a particular aspect of their CEEQUAL assessment. Due to the introduction of the new outstanding rating within Version 6, it is necessary to re-brand our Outstanding Achievement Awards to Exceptional Achievement Awards. This is purely a renaming/rebranding, it does not change any of the rules or technical scope for the awards. The next CEEQUAL Exceptional Achievement Awards will be held in London on 25th November 2019. Please contact us if you are interested in nominating your project for the awards or would like to be informed when further details are released. These unique awards highlight the very best performance being achieved by civil engineering project teams, irrespective of their total CEEQUAL score or award. The awards were first held in 2011 with further events in 2013 and 2016. 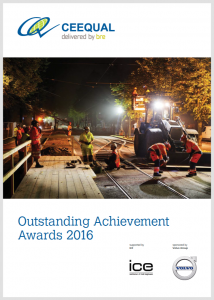 The winners of the 2016 Outstanding Achievement Awards were announced at a special awards dinner and ceremony on Monday 28 November 2016 at the Institution of Civil Engineers, One Great George Street, London. Twenty-two projects made it on to the shortlist for the awards following a record number of nominations. Exemplary achievements by a diverse range of projects were recognised in nine categories including ‘Project Management’, ‘Material Use’, and ‘Community and Stakeholder Relations’. Eight projects received Highly Commended awards. Read more about the CEEQUAL Outstanding Achievement Awards 2016.